Tim's extensive experience in the tobacco world dates back to 1999 when he started managing his family's cigar store in Omaha, Nebraska. 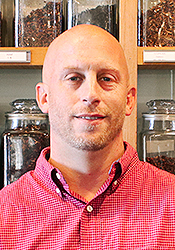 A driven and energetic personality balanced by a deep, caring mindset and courteous approach to people, Tim brings a breath of fresh air and vibrant spirit (not to mention a vast knowledge gained by years in the cigar industry) to Laudisi Enterprises as our Retail Store Manager at Low Country Pipe & Cigar and overall Cigar Specialist. He and his wife moved to South Carolina in 2013 and have since welcomed their first child to the family. As such, Tim loves spending time with his wife and son as well as entertaining his passion for yard work. With a bucket list full of exotic locales, such as Indonesia, Fiji, Greece, and Rome, Tim's next vacation will probably see him and his family abroad somewhere across the world. In the meantime, though, you'll most likely catch him listening to old-school hip hop or watching Game of Thrones, that is, when he's not faithfully serving our clients at Low Country Pipe & Cigar or woodworking with his wife.